For the past 6,000 years, Africans have been writing. Africa Writes 2015, a three-day festival in London, explored the continuation of this tradition in all its contemporary forms. From 3-5 July 2015, the Royal African Society held the annual Africa Writes festival at the British Library. A series of talks, themed discussions, keynotes and Q&A sessions, intermingled with performances and book-browsing, the festival was a celebration of creativity as well as a guided discovery of current African writing. The festival takes place in the British Library each year, but this year the significance of the space seemed heightened by the growing Rhodes Must Fall movement, which has quickly spread from the tip of the African continent to academic institutions in the UK. Rhodes Must Fall calls for the decolonisation of education, starting with the dead white men symbolically prized both by our monuments and in our reading lists, and leading to the transformation of our institutional structures. Two days earlier, Wangui wa Goro opened the festival with the reminder that writing originated in Africa, in the form of Egyptian hieroglyphs. Africa Writes went on to explore and enjoy a contemporary canon of literary work, rooted in history and blossoming across the continent and the diaspora. From the translation symposium (on the theme of love), which included singing, recitations and discussions about the uniqueness of languages and the universality of love, to the performance of Sunday, Africa Writes took us through many worlds. Ancient history, the recent past, and conjectured futures. Publishing houses, digital collectives, oral literatures, academic discourse. The myth of Afropolitanism (‘I don’t know why some cities are called cosmopolitan, African villages are cosmopolitan!’ said Ghanaian writer Nii Ayikwei Parkes). The programme was varied, and events rolled from one to the next with a lot of laughter and debate. The debate was largely discursive rather than combative. When the panel on literary magazines was asked by Nana Yaa Mensah of the New Statesman who they would regard as ‘competition’, Ndida Kioko (editor of Jalada) didn’t know how to answer her. ‘There is no competition,’ she hesitated, eventually, before shrugging. People might get annoyed with me at times, admitted Billy Kahora (editor of Kwani? and Associate Editor of Chimurenga Chronic), but he too shrugged it off, saying ‘I don’t have time [to engage].’ There is space for everyone. There is also space for literature to expand its influence and reach. Writer and academic Bwesigye bwa Mwesigire suggested that we should ‘humanise what we teach’ by using literature across every subject. He puts this idea into practice as a lecturer of Human Rights Law, and says that students find it more engaging to learn through reading literature than dry textbooks. Twice during the festival, I heard Bwesigye bwa Mwesigire recount his experience of working with Writivism to launch Jennifer Nansubunga Makumbi’s Kintu in Uganda in 2014. An epic based on oral history, the narrative shifting between 1750 and 2004 as it processes the past, Kintu had won the Kwani? 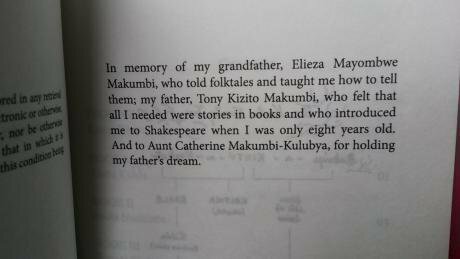 Manuscript Prize and was published by the Kenyan publisher. 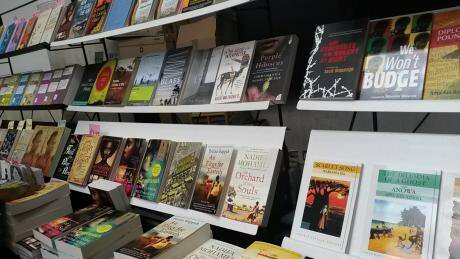 Despite its popularity elsewhere on the continent, and despite having a Ugandan author, Writivism didn’t have grand hopes for sales in Uganda because of the trope, as he characterised it, that ‘Ugandans don’t read, and they don’t read fiction.’ Yet at the Writivism Kampala festival, Kintu sold out. And Kintu kept selling out. It is now a Ugandan bestseller, having sold thousands of copies. Goretti Kyomuhendo, author and founder of the African Writers Trust and FEMRITE, said that in her experience this desire for ‘symbolic legitimisation’ meant that many young African writers she works with are not content with being bestsellers in Africa, because ‘they still have this sense that the West is the centre of gravity when it comes to publishing.’ ‘They want a piece of that cake,’ she said, characterising the ‘cake’ as ‘what Chimamanda has.’ Chimamanda Ngozi Adichie, of course, has global first-name recognition, three much-acclaimed bestsellers and a book of short stories, Western prizes, a film adaptation, a viral TED talk sampled by Beyoncé, her voice and words heard by pop-culture audiences around the world. It is difficult to see this ‘cake’ as anything but legitimised by the West. The panel discussion on ‘Observing the White Gaze’ grappled with what this Western legitimisation means for African writers and readers today. Ayo Sogunro, whose blog is one of the most widely-read in Nigera and whose debut self-published book,The Wonderful Life of Senator Boniface and Other Sorry Tales, sold 3,000 copies within a month, said that whatever your sales figures are like, ‘when people back home hear you have won the Caine prize, the Booker prize, it suddenly makes you special.’ Young writers have to grapple with an internalised white gaze twice over, then; first, as writers, to move away from the notion that only Western acclaim can provide legitimisation, and second, to write for an African audience that prizes Western acclaim nonetheless. At the start of the panel, Ayo Sogunro speculated what African writing would be like without the presence of the white gaze (i.e. without Western imperialism): there might now be certain dominant regional languages (such as Arabic, Swahili, Zulu), a localised publishing industry, African oral histories would have spread and, as a result, ‘Africa would be much more aware of its own rights.’ He went on to explain that currently, ‘the average American high-school student knows less about Shakespeare than the average African high-school student, but knows much more about American history.’ Later, Bwesigye bwa Mewsigire concurred, ‘people still read Shakespeare before Achebe.’ I also noticed, when I bought my own copy of Kintu, that the Ugandan bestseller’s dedication, to the author’s grandfather, father and aunt, also remembers Shakespeare’s significance. Toni Stuart, a South African poet, contributed from the audience with a discussion of Thando Mgqolozana’s decision to depart from what he termed the ‘colonial literary system’ in South Africa. The West is present in South Africa, Toni Stuart argued, in the legacy of apartheid structures which still pervade the publishing industry and readership. She brought illustrative statistics used by Ben Williams at a recent debate, ‘Decolonising the Literary Landscape’, at the University of Witwatersrand: only 1m South Africans (of a population of 53m) buy books, spending R2bn a year (£103m); they buy international bestseller fiction like James Paterson, Afrikaans literature, local non-fiction like cookbooks and sports biographies, occasionally politics, and Christian titles; local English fiction and poetry does not sell; of the top 88 books in the country, only To Quote Myself, at number 87, is written by a Black writer, Khaya Dlanga. South Africa has eleven official languages, Toni Stuart reminded us, yet the literary system is dominated by English and Afrikaans texts, by Western and White authors. The system distorts the local readership, too: NGO-funded libraries (which Mgqolozana terms ‘fake libraries’) don’t have books in local languages. This has an obvious exclusionary impact. This refrain – to locate a missing voice, and to use it – was echoed, too, in some of the strains of Ben Okri’s ‘Meditations on Greatness’ talk. While ‘images of success in the West do not reflect African writers,’ he also said that greatness has a ‘disregard for limitations.’ The role of writers is ‘to work on our minds…to challenge our perceptions of reality,’ and in many ways, I would argue, simply by writing stories, publishing or self-publishing, reaching readers through digital, radio waves or one of the traditional printed forms, African writers are offering their readership an alternative to the Western dead-white-men canon. Every story, then, becomes ‘revolutionary and rebellious,’ to use Okri’s words. On the final day of the festival, there was a perfect summation of the power of literature not only to ‘awaken us into ourselves,’ in Ben Okri’s characterisation, but, in doing so, to connect us to the world beyond ourselves. When A. Igoni Barrett explained that because he wanted to be read by Nigerians, he writes for them, it prompted an audience member to respond, ‘hearing you speaking about writing for Nigerians makes me want to read your stories so I can understand more about Nigerians – and I’m Ugandan.’ It was an illustration of how important a growing, living canon is, to connect readers to themselves and to others.